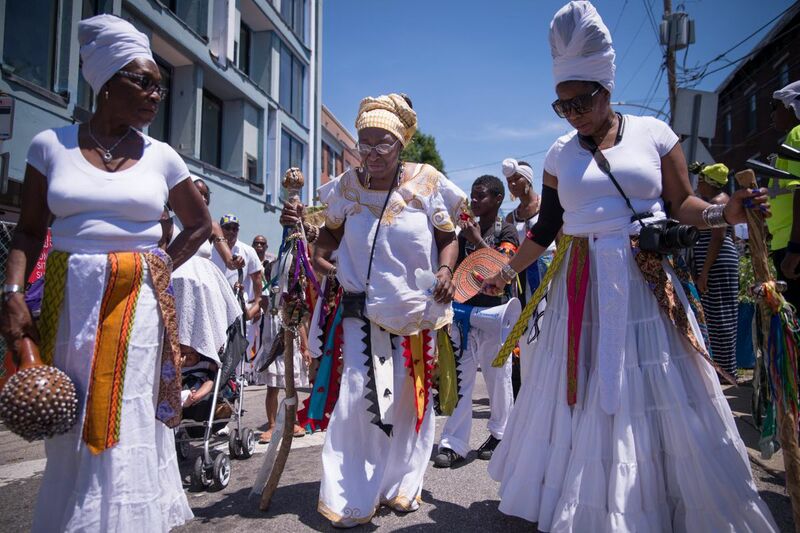 Iya Olakunbe Oludia, a member of the Wilmington, Delaware chapter of the Ifa religion, leads a procession down Grays Ferry Avenue during the Odunde festival, June 11th, 2017. Summer is finally upon us — did anyone think it would take this long? — and with it, plenty of exciting festivals to keep you busy on weekends. June opens with Odunde, a huge celebration of African American history and culture, as well as Pride Day. July brings the excitement of our nation's birthday and Blobfest, a quirky celebration of campy horror. And August closes us out with a block party in NoLibs and a weekend of folk music on a working farm outside Philly. Jeffrey Snyder and Lisa Gallagher at the 2017 Philly Pride Parade, which stretched from the Gayborhood to Penn’s Landing. Bastille Day at Eastern State Penitentiary.